Garofalo (Benvenuto Tisi), Italian painter, active mainly in Ferrara. Vasari says that he twice visited Rome, and his work - derivative but beautifully crafted - was heavily influenced by Raphael. 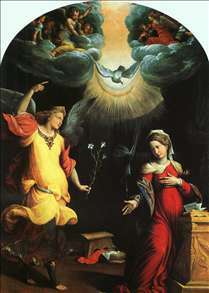 He was the first to paint in such a manner in Ferrara and was influential in spreading the High Renaissance style. 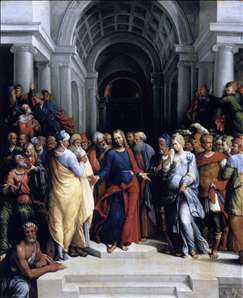 His output was large (frescos, altarpieces, small devotional works, also a few mythologies); there are many examples in Ferrarese churches and, for example, in the National Gallery, London. In 1550 he went blind. 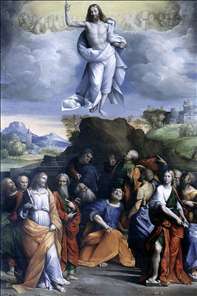 See more details about "Christ and the Adulteress"
See more details about "Ascension of Christ"